Sunday was the biggest long run in my training programme. 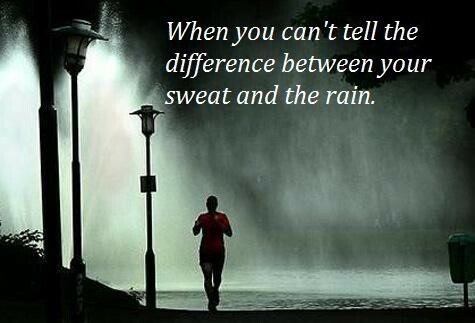 35km run mostly in the rain. The plus side was it wasn’t too cold, the minus side was it was windy! So in the end it felt a lot longer, and it showed in my time….3hrs 51mins. Afterwards I was soaked, but glad it was all over. I had done that illusive distance, I knew that the final hurdle had been leapt over and now there was just the slow winding down to Marathon Day! The rest of the training until then should be a doddle, right? Wrong! Monday I was tired – I did not want to do my strength workout, but I did it in the end. Yesterday I did an 8km recovery run – my legs felt like lead and I was feeling sluggish! Today I did a 14km run with km repeats – I couldn’t wait for it to finish! What am I going to feel like by week three of my taper? You’ll be great. Trust in yourself and the training that you’ve done. And, good luck! Thanks for that 🙂 As you say, I have to just trust all the work is done!